Hello, friends, and welcome to the second episode of The Greg Amundson Show. I’ve got some great stories in store for you today, plus a very special treat because I am going to take you back in time to a lecture that I gave at SEALFIT in Encinitas, California. Now, at this lecture, some groundbreaking insights and stories are woven into the fabric of the message that I share. You’ll get to be with me and with those athletes that heard that lecture live that day. So this is going to be a really exciting fun episode. Plus, this is an opportunity for some of you to hear my voice on the podcast while others are going to be joining us here on the YouTube channel. So here we go. This is going to be an awesome episode. In 2010, I was serving as a special agent with the DEA, the Drug Enforcement Administration. What an amazing group of agents to work alongside. I hold the DEA in the absolutely highest regard. An amazing group of true warriors. However, I also knew that I was not yet fulfilling the purpose of my life. I really enjoyed the work of a special agent. I was drawn to the warrior archetype and felt compelled to serve in that capacity. Yet, every night before I went to bed and every morning when I woke up, I just felt this tug in my heart and I felt God was calling me to something greater. God was calling me to another pursuit, another means of using the great gifts that God had given me in my life. One of the ways that I’m sharing those gifts was by teaching young kids — third, fourth grade students. I was teaching these young kids about the dangers of drugs, gang violence. I was trying to educate and inspire these young kids from the inherent risk that was sadly awaiting them living so close to the border with Mexico. So when I wasn’t pursuing the cartel leaders, essentially I was trying to prevent their kids from following in their parents’ footsteps. Well, here’s what happened. I had just finished speaking before a group of fourth grade students. On that particular day I was wearing a black long-sleeved shirt and across the chest in bright yellow it said “Police.” I was speaking in a very low income school on the outskirts of El Centro. As I finished speaking, a young boy came up to me. He pointed at my shirt and then he said, “When I grow up, I want to be a police just like you,” and he pointed at my shirt. I was overjoyed. I thought oh wow, maybe this is working. Maybe I’m getting through to these kids. So I kind of bent over so I could be closer to his height. I extended my right hand for the high five, which never came. Instead this young boy looks at me, shakes his head and he says, “I can’t do it.” And I said, “Why not? Of course you can do it. If you want to be a police, you can do it.” He said, “No, I can’t.” And I said, “Why not?” He said, “Because my dad told me I’m going to grow up and be just like him.” Matter-of-factly he said that. Whoa. Ouch. That young boy had never been told by his dad, “Son, I believe in you. Son, you can do anything your heart desires. Son, you’ve got what it takes to pursue and achieve your dreams and goals.” He never heard those words. And I heard those words, thank God. I heard those words every night from my dad before I went to bed. My dad’s encouragement in my life was undoubtedly the inspiration that I needed to achieve those dreams and goals. And this poor young boy, he never got that motivation, that encouragement, that support, that love from his dad in the way that he needed it most. And in that moment, at that school, just outside San Diego, El Centro County, in that moment, time stood still for me. And in that moment, two great insights occurred to me. The first one is that you and I, my friends, we never know when our words of encouragement will be the first words of encouragement that someone has heard that day, that week, that month, that year or maybe like that little boy at that school, that lifetime. We just never know as we go through the course of our day, if we are going to be that source of encouragement, that word, that voice of “You can do it!” in someone’s life. It made me realize that is exactly the manner in which God works through us, my friends. In the Bible it says, “As iron sharpens iron, so one person can sharpen another.” More often than not, it’s our words that are that sharpening stone that are allowing us to keep each other sharp. It’s our words that are allowing us to be the voice of encouragement in other people’s lives. We have to really be mindful of what we say in the company of our loved ones because our spoken word holds such immense power. In any given moment of an interaction with a loved one or a complete stranger, we never know what that person is dealing with. Heaven knows you and I are dealing with the circumstances in the events in the conditions of our life. Well, guess what, so is everyone else. And what everyone else, including ourselves, is therefore a bit more desirous of is love and encouragement. I mean, I keep coming back to the wisdom which my mom shared with me shortly before she passed away. She said, “Greg, everybody can encourage somebody and be supported at the same time.” And this is essentially the way that karma of “Reap what you sow” can be experienced in our lifetime. As you and I become the voice of encouragement for other people, we allow ourselves and open ourselves up to the opportunity for the universe to then bring people into our life who can encourage and support us. So the first insight was let’s all be a bit more encouraging of each other because we just never know when that opportunity will present itself for our word of encouragement to be a life-changing moment in someone’s life. That’s number one. Number two is sometimes do you realize where the voice of encouragement is going to need to come from? Within. Within. Sometimes that voice of encouragement, that voice of, “You can do it,” that voice of, “I believe in you,” that voice of, “You’ve got what it takes,” that voice sometimes in the dark night of our soul needs to come from within. This is what is referred to in the warrior tradition, the warrior archetype as intrinsic motivation. The warrior develops the ability to turn their attention inward, to rely on themselves, on their inherent self-worth to accomplish their dreams and goals. Therefore, as the warrior begins to work within, as we strengthen our hear, our mind, our soul through the constant repetition of feeding the dog of courage, as my dear friend Mark Divine would say, as that happens, as we fill ourselves from within, as we provide ourselves of all sorts of motivation, as we receive encouragement, support and motivation from other people, it only enhances what is already there. We’re not dependent or relying upon any external condition or circumstances including the encouragement of others for we are ultimately relying on ourselves. Now, that being said, as we turn the attention inward and learn to develop intrinsic motivation, this is that sweet moment when we also open ourselves to the presence of God. This is when things get really exciting for the man or woman of faith. In the Bible it says, “I can do all things through Christ who strengthens me,” and the Bible continually reminds us that God is in us. Therefore, as we begin to turn the attention inward, developing intrinsic motivation, strength within, that strength within is not based on our own strength. It’s based on the strength of God in us. And then these two things can become yoked. We can begin to use our voice to encourage others, our self-talk, and the way we speak to others becomes a means by which we communicate with ourselves. And that support, that belief, the way that we use our voice is then based on our faith and the word of God. And that, my friends, is when we begin to tap in to more power, more opportunity in our life than we ever dreamed possible. Let me share with you what happens when we really begin to tap in to this power that is within each and every one of us. So very often, the great scholars, the great teachers, the great mentors in our life are encouraging us to be mindful of our pursuit of life purpose. You see, I firmly believe that every single one of us was born with a very specific mission, a purpose in our life to accomplish. And as we move closer and closer and closer to the pursuit of the purpose of our life, we realized that our words are one of the main means in which that life purpose can be fulfilled. As we begin to speak with that certainty that we were born for something so great that we can barely fathom it, we become very, very careful about the way that we use our words, very, very careful because our words hold such immense creative potential. Every time we speak, our words are, therefore, either moving us a little bit closer or a little bit farther away from the purpose of our life. And as we move closer to the purpose of our life, God begins to open some big doors for us. Consider the analogy of a parent. Any parent begins to increase their level of trust in their children as their children show their parents that they can be responsible with the power and the trust that they are entrusting them with. Well, God is our Father and he operates the same way. As we show God that we are beginning to understand and fulfill the purpose of our life, he will entrust us with greater and greater power. And as we show that we are being responsible with that power, the cycle begins to repeat itself. More power, more responsibility, more power, more responsibility, it continues on and on and on in really amazing profound ways. This, my friends, get super exciting because this is when we begin to tap into that realm of miraculous. This is when our lives are completely changed. This is when our lives are never the same. Have you heard that term coincidence? Oh, it’s coincidence. There’s no such thing as coincidence. When you are experiencing coincidence in your life that is God winking at you showing you you’re on the path. He’s opening doors for you. He’s bringing people, events, circumstances, learning opportunities into your life that you need in order to take that next step. Everything that we need, God is providing for us. And as we step on to our life path, as we begin to pursue the purpose of our life, God begins to open doors for us. The key is to understand that we’ve got to trust that in time everything we’re experiencing in our life, both those things that we’re adamant are this awesome and those things that we’re adamant this is horrible, both what we’re desirous of and what we have an aversion to are ultimately in time for our good. Before we go to SEALFIT and I share with you some of the stories that took place there, which I know you’re going to love, let me just share with you something that recently happened, which further ties in to everything I’ve shared with you thus far. This is really quite incredible. So behind me I have a painting that says, “I am with you.” This painting and several others were part of a collection that I made after God put on my heart this idea for spiritual truth, where I was puling only small excerpts from the Bible and bringing them to life on these large 36 by 36-inch canvases. That particular painting behind me and several others, were part of an art show at my favorite coffee shop here in Santa Cruz called Coffeetopia right next door to my gym on Portola Drive. Wow, talk about being brought to your knees. How amazing. How amazing. And the reason I share that and that I opened our episode today with the story of me as a DEA special agent telling that young boy you can do it is again this is how God works, my friends. As we begin to move closer and closer to the purpose of our life, this is exactly the experiences that God will bring into our life. This is exactly how we can be that encouragement for others. We just never know, but we’ve got to trust that every day in every way possible, as we draw closer to the purpose of our life, our life purpose touches other people. You see, the fulfillment of our life purpose, the mission that we’ve all been given, the unique mission is not for our own self gratification. Oh, no, quite contrary. You and I were born to be of service to others. The purpose of our life is to ultimately encourage and support other people. Isn’t that awesome, my friends? So now without further ado, I’m going to take you to my dear friend Mark Divine’s gym, SEALFIT in Encinitas, California. We are going to drop in on a lecture that I gave. And in this lecture, I am going to share with the athletes who are in attendance some of the most classic, powerful, memorable warrior tradition stories that have never been told. Yet, you’re in store for a real treat because one of these particular stories is going to be shared through a very unique brand-new perspective. Without further ado, my friends, come with me. We are on our way to Encinitas, California to SEALFIT. One of the ways we can assess the quality of what’s taking place between our ears is the quality of our thinking. One of the ways we can assess the quality of our thinking is by bringing awareness to the very words that we are speaking. So I want to take you back in time to one of the greatest stories ever told in the warrior tradition. Mark Divine and I, we are passionate about sharing the stories from the warrior tradition because so much of what we’re desirous of learning and experiencing in our life can be learned and cultivated by walking the path of a warrior. So we go back in time to one of the greatest stories ever told about one of the greatest warriors who ever lived. His name was Heraclitus. You guys feel that? Where does that story hit you? You feel the energy in that story and how it hits you? When I was hit by that story, I thought that what Heraclitus saw must have been such a physically robust, resilient, strong, chiseled, muscle-bound warrior that I spent years and years and years through the various disciplines I was pursuing trying to develop that physical quality that we’re all certainly desirous of. We all want to physically be the role of the warrior. Well, last Thursday I was preparing to give a very similar talk at my gym in Santa Cruz. I was at my desk making notes. All of a sudden God puts something really amazing on my heart. Here’s what God put on my heart. He said, “Greg, Heraclitus was meditating.” Imagine if we’ve been misunderstanding the story for all these years. Imagine if rather than Heraclitus being surrounded by an enemy force, he was surrounded by the negativity in his mind. So he used the practices of the warrior, the inner work of the warrior. He pulled back. He achieved awareness, cultivated greater perception of his mind. Rather than being his thinking, he became aware of his thoughts. Then once he pulled back and he was able to assess his thinking, he noticed in that perception of his thinking there were 100 thoughts circulating in his mind. So he didn’t walk up and down the rank and row and physically assessed other people. He pulled back into the temple of his mind, his soul, his spirit and he conducted an inspection of each thought in his mind and he noticed there were 100. And of the 100 thoughts in his mind, 80 were targets. Eighty thoughts were feeding the dog of fear. Eighty targets needed to be knocked down. They were feeding the dog of fear. Ten thoughts that he brought awareness to were not thoughts of his own. They were ways of thinking that he had inherited from other people, ideas that were circulated in his mind that other people had dropped there. I’m sure we all have experienced that, ways of thinking that are no longer serving us that we’ve inherited over time, habits of thinking, grooves in our brain that direct the course of our life below our consciousness. Yet, that’s the quality of the inspection. He was able to conduct in that meditation deep awareness. Ten thoughts didn’t even belong there. Nine thoughts were good. They were good thoughts. Yet, they still weren’t serving his highest purpose. And then finally, in his meditation during the assessment, he found the one. He found the one thought out of 100 that were in perfect alignment with his life purpose, perfect alignment with his most divine spiritual nature. One thought out of 100 soulfully fed his dog of courage, and he knew if he could focus on that one thought, it would bring his entire way of thinking home. The reason I share these two stories is this is a perfect example, my friends, of how we can begin to integrate yolk, as we say in yoga yolk, the mind and the body. Of course we’re all desirous of these types of workouts. We want more reps, we want greater range of motion, we’re certainly desirous of looking the part. That’s wonderful. That’s a great adaptation, as Coach Glassman would say, to CrossFit or to SEALFIT or to a yoga practice, to any physical endeavor. Yet, simultaneously, we can recall the story, the lesson inherent in the story, and we can simultaneously cultivate our mind the quality of our thinking. Now, I want to share with you another remarkable story, a new way perhaps of hearing or reading or contemplating a story that’s been told since the beginning of recorded history. As many as you probably know, I’m a Christian. In addition to Firebreather Fitness, one of the other books I’ve written is God in Me, daily devotionals for a heart like Christ, and I love studying the life of Christ because Christ was a warrior yogi, without a doubt one of the greatest warrior yogis to ever live. During his life, like any great leader, his leadership and his message was continually challenged. On one given day or group of spies who have been spying on him and trying to set him up noticed that when he and his disciples were eating, they were not washing their hands before they ate food, which was a grave violation of the law at the time. So they called him on it and they said, “We’ve noticed that when you and your disciples eat, you’re not washing your hands. Do you think you’re greater than the law?” And he replied, “It’s not what goes into your mouth that defiles you; it’s what comes out.” What a radical concept at the time. Yet all these years later, has anything changed or are we perhaps in a day and age when it’s even more important to cultivate awareness of what we’re saying? Think about the New Year’s resolutions. Safe to say that in this gym many of us had New Year’s resolutions regarding nutrition. We want greater awareness of the food that we’re eating. Yet, consider the wisdom of what Christ said. As important as awareness of what goes into our body is, what’s even more important is what we are saying. It’s what comes out. It’s what we’re speaking that ultimately makes the man or the woman, the quality of our speech. Well, I stumble off the bus and lo and behold there on the ground are yellow lines. And I stand on the yellow line and the yellow lines make a military platoon formation. I’m standing there, shaking, fearful, nervous as can be, and in front of me walks someone I will always remember, Senior Staff Sergeant AKA Drill Sergeant Oliver. Drill Sergeant Oliver, my recollection is this guy was five feet tall and five feet wide of solid muscle. Terrifying to look at this guy. I never once made eye contact with him, terrifying. He stood in front of our platoon and here’s the first thing he said. He said, “Listen up, prives.” He wouldn’t actually call his privates for nine more weeks we graduated boot camp. He just said prives. He said, “Listen up, prives. In my army, I want warriors and warriors think a certain way.” I was standing at attention and when he said that I felt my body and my soul and my spirit start to lean forward. I was drawn to him. I knew the universe had brought me there and had brought him there at that exact time in that exact place because he had some wisdom to transfer to me. Here’s what he said next, “In boot camp, your thoughts will precede your words. Your words will precede your actions. Your actions will cultivate your habits. Your habits will make your character and your character will determine your destiny. And I want warriors.” Now, that’s a profound thing for anyone to say especially a senior drill sergeant in the US Army. You know why? Because Staff Sergeant Oliver just quoted Gandhi and that’s the way of the warrior. That’s the essence of the warrior. That’s the heart and the fist. That’s the sword and shield. That’s the true warrior that we’re all desirous of being. What determined our destiny? We reverse-engineer it. What’s at the foundation of everything? Our thoughts. Our thoughts determine the quality of what we say. 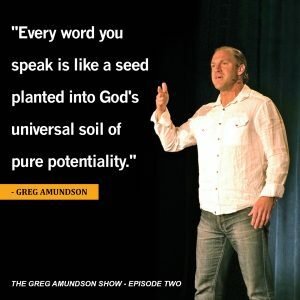 Everything that we say takes on the quality of a seed. Over time that seed will sprout. Then we harvest the quality of what sprouted which was determined by the quality of the seed that we first planted. The quality of that seed resided in our mind. Well, my friends, I hope you enjoyed that live lecture and seminar conducted at SEALFIT in Encinitas, California. Some of my favorite stories were shared there, and as you undoubtedly saw, one of those particular stories about Heraclitus was shared from a very unique perspective. My friends, I just want to thank you for spending this time with me here today on The Greg Amundson Show and I really look forward to joining you again in two weeks back here on the show. Until that time, may God bless you and keep you safe, and I will talk to you soon, my friends, right back here on The Greg Amundson Show.